This past Saturday, the TreeStewards class of 2011 met at a designated spot along the Bluemont Junction Trail in Arlington for a hands-on lesson in pruning. Patrick Wegeng demonstrates proper pruning practices (photo by N. Palmatier). It turns out you don’t just pick up a saw and have at it. First, we learned it is best to know what kind of tree you are pruning, so Patrick took us on a tour of trees along the trail — careful not to get in the way of the runners, cyclists and baby carriages passing along the path. It was quite an unusual collection of trees within just a few hundred yards — swamp oak, white oak, red maple, bald cypress, yellowwood, birch, beech, sweet gum, magnolia, dogwood, cherry, sycamore, london plane, black locust, serviceberry and more with an odd buckeye and black walnut thrown in for good measure. And all of these trees were easily visible from the trail. Identifying the tree species is an important clue in deciding how to prune to create the kind of structure this tree might have in its native setting. Once we had an overview of the landscape, it was time to prune and Patrick told us to focus on the three D’s — dead, diseased and damaged limbs. And then after that, he said, it was largely about art. 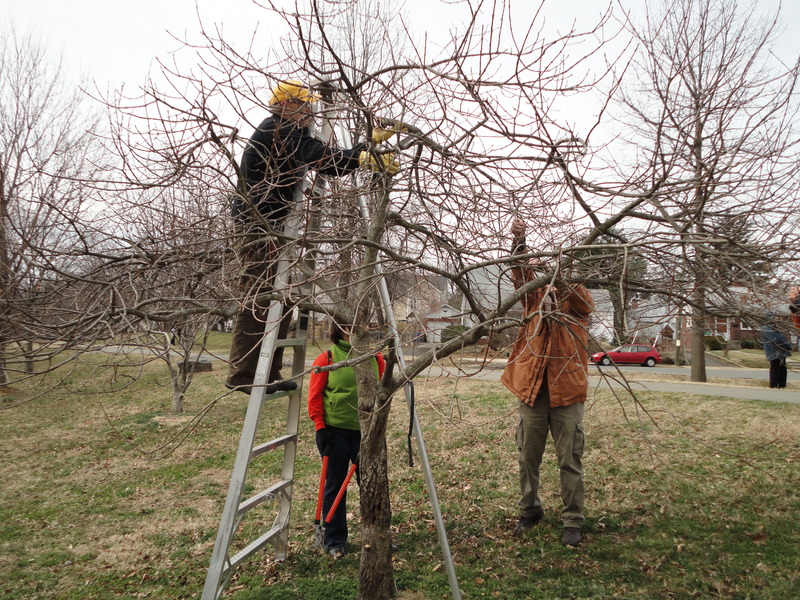 Patrick Wegeng (on the ladder) demonstrates pruning to members of the TreeStewards class of 2011 (photo by N. Palmatier). Eliminating competition — cutting out branches that are crossing or growing toward the trunk instead of out and up — immediately improved the form of the tree. We felt like sculptors — making a few adjustments to the masterpiece and then stepping back to appreciate our work and consider further refinements. 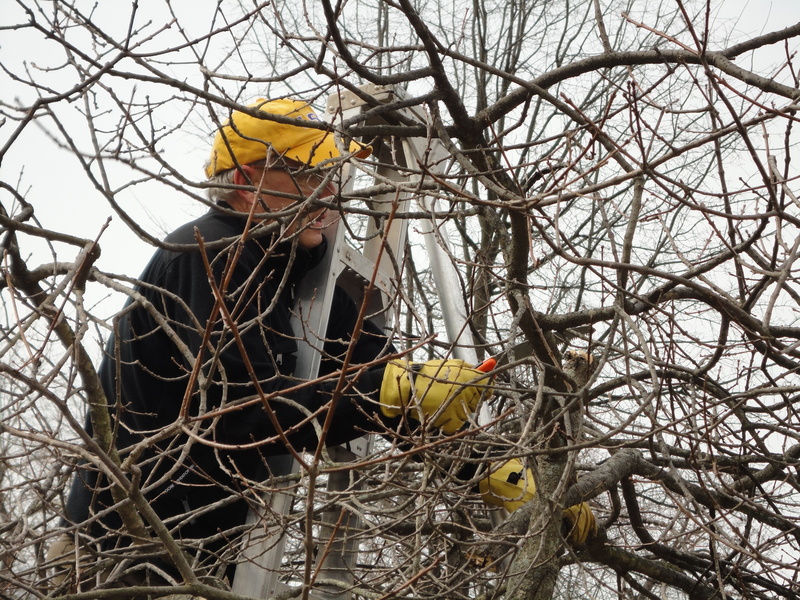 Patrick also said it was important not to fall out of the tree — safety being the chief concern when pruning. Taking care when climbing the ladder and wielding toothed equipment is important not just for the pruner, but also for the idle onlookers and the innocent pedestrian passing at an unlucky moment. Lastly, we were encouraged to return to the trail throughout the growing season to observe the impact our cuts will have on the future growth of the tree. It is most definitely a lesson to be continued. For more on pruning, please see this Extension Service guide. This entry was posted in Education, Events, Tree Care and tagged Arlington, pruning, training, TreeSteward class. Bookmark the permalink.